This is an impressive and extensive station of comparatively young age. It derives from a need to rationalise a number of duplicate lines and stations on the Isle of Thanet, legacies left by the erstwhile SER and LC&DR companies, but never rectified by the subsequent SE&CR Joint Management Committee. The SER was the first company to reach Thanet, by means of a rather circuitous route from the capital. The company had commenced running between London Bridge and Ashford on 1st December 1842, with a subsequent eastward extension to Folkestone on 28th June of the following year. On 23rd May 1844, the company received Royal Assent for the construction of a thirty-four mile branch from Ashford to Margate – at this time, even Dover had yet to be reached. The line, which assumed a north-easterly heading via Canterbury, took little over 2½ years to construct, and through running to ‘’Margate Sands’’ station was possible from 1st December 1846. This had been preceded by the opening of stations at Canterbury and Ramsgate (Town) on 6th February and 13th April 1846 respectively. 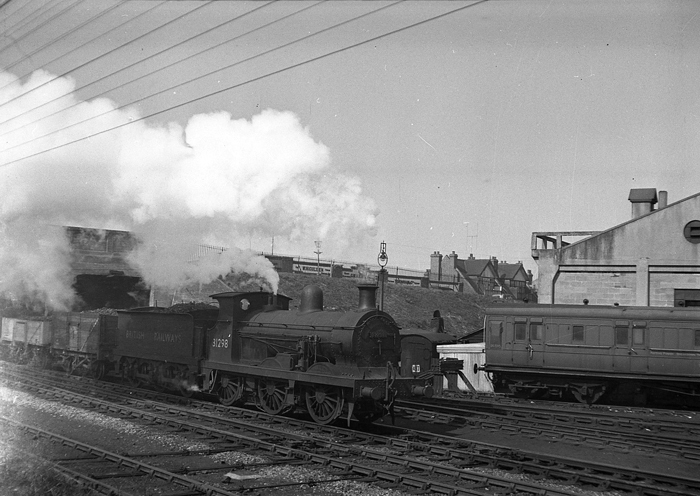 For a decade the SER enjoyed a monopoly of rail travel on the Isle of Thanet, but competition in the form of the ‘’East Kent Railway’’ would later have to be endured. This company, which was renamed the ‘’London Chatham & Dover Railway’’ in 1859, had begun operating between Chatham and Faversham on 25th January 1858. Subsequent expansion saw services extended to Whitstable on 1st August 1860, and trains soon reached Ramsgate, a station at the latter formally opening on 5th October 1863. These eastward extensions between Faversham and Thanet had been constructed by a nominally independent concern known as the ''Herne Bay & Faversham Railway'', which renamed itself on two later occasions. Through running between Victoria and Canterbury had been possible since 3rd December 1860. In 1924, the SR finalised plans to implement a rationalisation programme on the above stations, and those lines which served them. This would result in the complete closure of the SER’s Ramsgate Town to Margate Sands branch, and the retention of the LC&DR route via Broadstairs as Thanet’s only line. Margate West was to remain: enlargement of this station had begun under the SE&CR, which had included new platform surfaces and elaborate canopies. The SR was to perpetuate the improvement works by erecting new platform structures, which included a replacement 265-foot-long station building on the ‘’down’’ side. The approaches to the station at Margate Sands had also been designated for a large goods depot, to replace the comparatively small affair alongside the ex-LC&DR station. Both Margate East and Broadstairs stations were to be retained as part of the existing LC&DR line rounding the edge of Thanet; the site at the latter was to be modernised, which included the erection of a new 195-foot-long station building on the ‘’down’’ side. Of the LC&DR sites, only Ramsgate Harbour was to succumb. The ex-SER’s Thanet line was to be truncated at the junction where the route split for the company’s Margate and Ramsgate stations, and the ex-LC&DR’s metals would stop just before the line plunged into the tunnel for Ramsgate Harbour. Thus, between the two once independent lines, a gap of approximately 1½ miles existed. This would be filled with a double-track line and as a result, the route around Thanet would become a continuous loop. 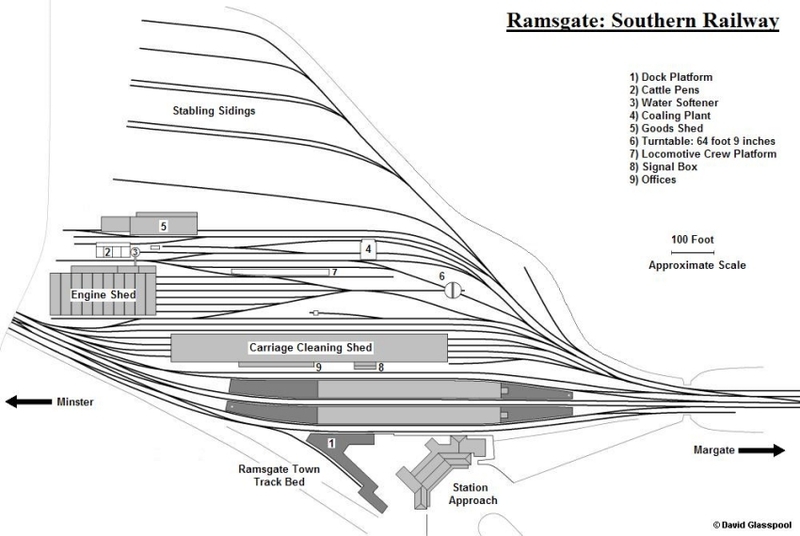 As mentioned earlier, Ramsgate was destined to lose both of its existing stations during the SR’s reorganisation. In their place, a completely new site was planned to lie upon the 1½-mile-long connecting line. The latter, and all modernised and new sites, were formally deemed complete on the opening to passenger traffic on 2nd July 1926. The SR’s Ramsgate station resided on a huge site within the parish of St Lawrence, some two route miles south of Broadstairs and one mile inland. The land was formerly occupied by the triangular junction of the SER’s Margate Sands and Ramsgate Town lines, and a ‘’St Lawrence’’ station also existed here until its closure on 3rd April 1916. Since the SR was able to start from scratch at the site, no half measures were taken, and the opportunity presented itself to incorporate as many facilities as possible. The station was spacious and well-laid out: two islands, of solid concrete construction, were brought into use. These were 765-foot long and were protected by attractive trapezium-shaped canopies. The latter consisted of a steel framework, and each canopy stretched for a length of 435-foot along the islands, measuring about 43-foot at their widest point. They were supported above the platforms by pairs of iron struts and unusually, whilst the canopy ends were constituted of vertically-aligned timber, the side valances were of riveted steel construction. 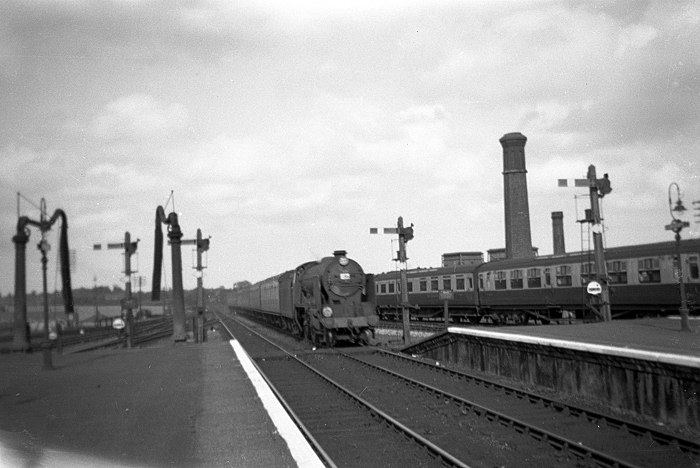 The islands were equipped with the SR’s distinctive swan-neck wrought-iron gas lamps (which had the SR’s trademark ‘’Target’’ name signs attached), and the platform name boards were framed by the now renowned prefabricated concrete of the ex-LSWR works at Exmouth Junction. Brown brick waiting rooms were present on each surface, these demonstrating sash-style windows, and a water column existed at the western and eastern end of the southern and northern islands respectively. The main station building was positioned south of the platforms: this was built at 45 degrees to the running lines and was separated from the nearest island by a double-track. The structure was constituted of the same brown brick as that which could be found in the contemporary building at Margate, and was three-storeys in height. The main booking hall was a light and airy environment, measuring some 50-foot by 85-foot, and elegant interior decoration and styling matched that at Margate. The building in turn was flanked on either side by single-storey pitched-roof appendices, producing a U-shaped station façade. This was met by an approach road which terminated in the form of a continuous oval. The main building and platforms were all linked by a brick-lined subway, which tunnelled under the tracks at the eastern ends of the islands, and each surface was served by two flights of stairs and a lift. The shafts of the latter were encased in horizontally-aligned timber above platform level. The subway surrounds at platform level were tastefully lined with patterned iron fencing, and lighting was suspended above the stairs by horizontally-secured members. The site of the original Ramsgate Town station subsequently gave way to 1930s housing.